Blurb: In this fifth book in the Magykal series, Septimus ends up on a captivatingly beautiful island, one of seven set in a sparkling sea. He's stranded there with his badly injured dragon, Spit Fyre, along with Jenna and Beetle. There are some strange things about the island, including a Magykal girl named Syrah, a cat-shaped lighthouse that has lost its Light, and an eerie presence that sings to Septimus—can he escape the persistent call? 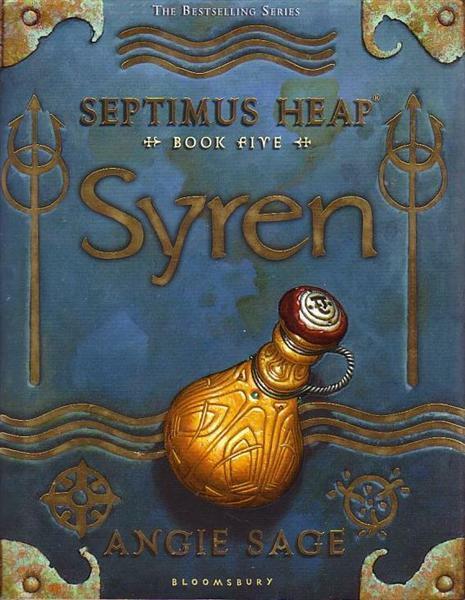 Thoughts: I love the Septimus Heap series and Syren is no exception. I really loved the characters. They're really well written. You can almost feel like your know the characters, they're so relateable. My favourite character would have to be Jim Knee. His habit of calling Septimus names while pretending to respect him is hilarious. Plus, he's a jinnie (genie), what's not to like? Now I'm going to read Physik. Yes it's the third book in the series, but I didn't know we owned it. That was a delightful surprise! Have you read Syren? Did you like it? Who was your favourite character?